Jump clinic with Olympic & National skaters! A special Jump Clinic opportunity with Olympian and Canadian National Silver Medalist Keegan Messing, and two-time U.S. National Junior Medalist Jimmy Ma will take place at the Cleveland Skating Club on Saturday, May 12th! The Clinic is open to all USFS skaters at the Pre-Preliminary through Senior Free Skate levels. All attendees will be given one free seat to the Ice Show on the night of their choice (May 11 or 12) and the option to purchase more seats and see Keegan and Jimmy in action! Email CSC Rink Program Director Kim Brack kbrack@clevelandskatingclub.org to secure a spot! Join us for Spring Swizzle Picture Day! Please join us on Tuesday May 1 at 6:00pm for Picture Day! All Spring Swizzle participants are invited to come and have their picture taken in their performance costume FREE of CHARGE! Pictures will be displayed in the lobby of the rink the night of the show. After the show is over they are yours to keep as a souvenir! *Please Note – pictures will be taken on a first come, first serve basis. We will be taking photos from 6-7:30pm. Makeups will take place prior to dress-rehearsal on Thursday May 3 at 5pm. Our show will be recorded in HD video from ice-level on the night of the show. Please note: There will no video-recording allowed from the stands on personal cameras or phones on show night. PLEASE NOTE: We need a minimum number of video orders to have our show recorded! If we fall short of our minimum, pre-payments will be returned on dress rehearsal night. Spring Swizzle NEWS & UPDATES! Part of the magic of a Brooklyn show is our show lighting, but we need your help to pull it off! Do you know someone who is available to run spotlights for dress rehearsal night and/or performance night? The Brooklyn Figure Skating Club is selling T-shirts for this year’s show! Shirts start at $18 and will feature the names of all of the show participants on the back! ORDERS ARE DUE BY SUNDAY APRIL 22! To keep the show moving in an orderly fashion, we are in need of a few parent volunteers to help keep our backstage area quiet and running efficiently. Please email us if you are interested in becoming a parent volunteer for dress rehearsal and/or show night. What’s your earliest memory on the ice? Everyone starts skating by taking that first step. And no matter what age you were, the ice was slippery and it probably seemed scary. But soon, you learned that you could fly! What are your best memories about learning to skate? 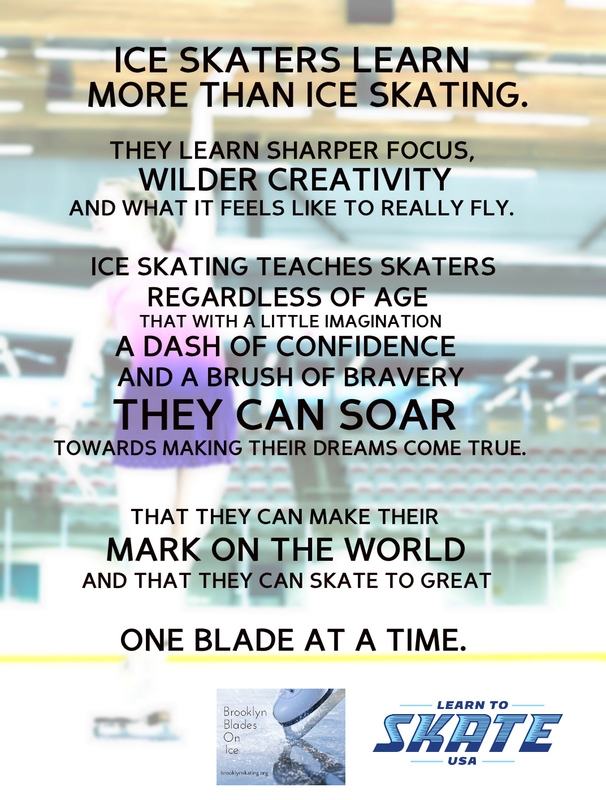 SHARE THEM with us and we will feature them in a poster in the rink! Please email your submissions by April 27!